CODY CANADA & THE DEPARTED are back with their 4th album and they call it 3 !?! 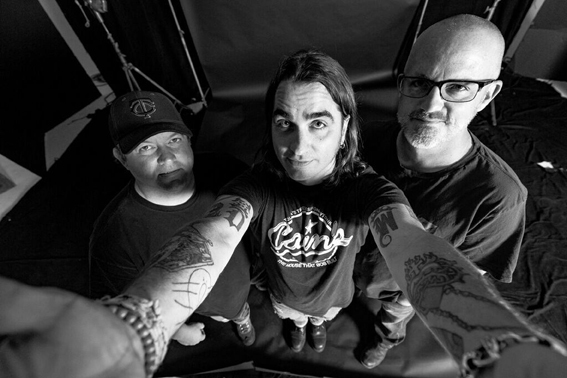 Since the demise of Cross Canadian Ragweed in 2010, their mastermind Cody Canada has made some efforts to move on from the band’s glorious past and discover new ground. With The Departed he released three varied albums between 2011 and 2015 – but now he has decided to get back to exactly the type of music that brought him the most fun and success. Between 2002 and 2006 Cross Canadian Ragweed were the red dirt band to take note of. That band’s name will certainly stay in Oklahoma’s music history books. Now, the new album by Cody Canada & The Departed is entitled 3 which is somewhat surprising given that it’s their 4th release. The title indicates that the former quintet and quartet is now down to a trio. This power trio in every sense of the word delivers 14 tracks with great variety and a great, tailor-made sound. Cross Canadian Ragweed embodied the sound and attitude of the Oklahoma/Texas red dirt scene like no other band. Their (red) dirty mix of guitar-driven country, Southern rock, singer-songwriter sounds, heartland rock & boogie was irresistible and highly successful. Between 1998 and 2009 they released ten albums some of which reached the Billboard top ten! Their concerts from San Francisco to NYC, New Orleans to Chicago were often sold out and the band achieved almost legendary status in their home region of Stillwater, Oklahoma and later anywhere between Austin and New Braunfels, Texas. However, it all became a little too much for bandleader Cody Canada and he pulled the plug on the band in 2010. Only to return from the ashes with a new band shortly thereafter. The newly-born Departed were signed by Blue Rose without hesitation. Their first sign of life was This Is Indian Land in 2011, a colossal homage to their Oklahoma forebears Leon Russell, J.J. Cale, Bob Childers, Tom Skinner and others. Their second release Adventus (Blue Rose, 2012) was a pretty radical step away from red dirt, Texas rock and Americana – unbending electric rock’n’roll, a kind of Southern hard rock, brilliantly played but perhaps – at least for Ragweed fans – a little short on soul. In spite of an innovative spirit, an experimental mindset and a love for challenges, Canada felt like a stranger in his own band. The next album HippieLovePunk (Blue Rose, 2015) had a warmer, rootsier sound with a hint of a psychedelic “garage” vibe. 2013 saw the release of a Cody Canada live double album Some Old, Some New, Maybe A Cover Or Two, yet another live double album came out in 2015: Chip & Ray – Together Again For The First Time with Mike McClure his former mentor and something of a godfather of the red dirt scene. In 2016 Canada’s longtime friend and bass player took on frontman duties on the country album In Retrospect, released by Jeremy Plato & The Departed. And now, after a period of self-rediscovery, Cody Canada returns to the spirit of Cross Canadian Ragweed with new material and a trio formation that sees him play all kinds of guitars, as well as piano, organ and harmonica. We also hear his raspy inimitable voice again. Jeremy Plato is still irreplaceable on bass. On drums we find a well-known name from the Okie scene: Eric Hansen who has played with everyone from Jimmy LaFave, Bob Childers, Greg Jacobs to Stoney LaRue as well as in the Mike McClure band in the last twenty years. Speaking of McClure: For the first time in The Departed‘s history Cody Canada is collaborating with his right-hand man for almost all of CCR’s output. McClure’s involvement is deep: He acts as producer, co-writer on a number of songs and contributor of various guitars and backing vocals. Joe Hardy, another familiar collaborator, mixed the album. It’s exactly this feeling of loyalty and friendship that permeates the entire 3 project. With the opener „Lost Rabbit“, an astonishingly effective minimalist rock’n‘roll number, Cody Canada & The Departed start out strong. It is followed by the first Canada/McClure co-write in years, ‘Lipstick’, a temperamental red dirt/country rock hymn with a remarkable harmonica break, two electric guitar solos, beautiful harmony vocals and a terrific hook. The song’s about love and betrayal seen through a prostitute’s eyes – possibly a new “Fightin’ For”? We will find out on the upcoming tours. ‘A Blackbird’ is a fast talking folk number driven by special guest Danny Barnes’s banjo. ‘Daughter Of The Devil’ is a straight rocking Okie shuffle not unlike “This Is Indian Land”, written by red dirt protagonists Mike McClure & Tom Skinner. “One Of These Days” is another Skinner song in a stripped-down acoustic setting with multiple guitars, bass and a little percussion. Jeremy Plato sings a strong lead vocal just like he did on the aforementioned Departed country project. But Canada is also capable of doing straight country: He does a cover of Merle Haggard’s “Footlights” as a duet with Robert Earl Keen while Cody Angel’s (Jason Boland & The Stragglers) steel guitar gently weeps. “Paranoid” is a solid, no-frills rocker with twelve year-old Dierks Canada, Cody’s son, on electric guitar. The second part starts with “Satellites And Meteors“, a dyed-in-the-wool country rocker with great lead guitar parts and vocal harmonies by Jamie Lin Wilson of The Trishas. “Unglued” with its semi-acoustic arrangement featuring harmonica and banjo is reminiscent of Steve Earle’s roots rock a la “Johnny Come Lately”. The power ballad “Sam Hain” presents Canada’s thoughts on the American elite in an advanced mid-tempo number with crunchy electric guitars and an irresistible chorus. “Song About Nothin’” with its red dirt-style country rock is bound to appeal to fans of Reckless Kelly while “Better” is a relaxed Okie folk number. The Departed get funky with their cover of “Betty Was Black (And Willie Was Wghite)”, the anti-racism Southern talking blues/boogie written by East Nashville heroes Tommy Womack and Will Kimbrough. The album ends with an acoustic road movie/love song entitled “1800 Miles”, five minutes of dark, atmospheric slow folk not unlike some Springsteen tracks. It’s followed by a few seconds of hidden track banter with Robert Earl Keen. In the album notes Cody Canada thanks everyone who has been with him from the beginning – not a small number of people, and he has made many new fans in the past two decades. 3 is bound to not only appeal to his community but also win over many fans of Americana who are not necessarily deep into the Oklahoma red dirt scene! Kommentare deaktiviert für CODY CANADA & THE DEPARTED are back with their 4th album and they call it 3 !? !